When you decide to quit you are not just fighting the ritual, but your addiction to nicotine (a chemical that is released every time you smoke a cigarette). Nicotine patches are a form of nicotine replacement therapy. The Nicotine patches work by giving you the nicotine your body craves during smoking withdrawal in a safe, measured way. Buy Habitrol Patch online at a great price. 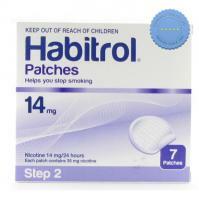 This is a 21mg Dose Nicotine Patch and is the first step in a three steps system to quit smoking. Use this patch during the first phase of quitting. 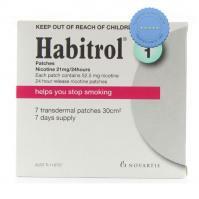 Habitrol Patch (14mg) helps you to give up smoking by relieving the desire to smoke, as well as some of the unpleasant effects. Each box contains 7 patches. Nicotine patches stick to your arm or lower back and gently release nicotine into the bloodstream through your skin. The patches come in different strengths for use during different stages of your withdrawal. They help you get on top of nasty nicotine withdrawal cravings that can leave you feeling horrible. Once you have got used to not lighting a cigarette every day you can gradually reduce the strength of the patch and length of time you wear it until you are no longer dependent on nicotine. This system comes in 3 steps to curb your addiction to nicotine so you can stay off the smokes. Heavy smokes start at Step 1 is the highest dosage at 21mg of nicotine, then begin to ween themselves down to the 14mg patch and eventually the 7mg patch. These patches gradually release nicotine into your system over 16 hours during the day, then give your body a break from nicotine while you sleep. They are easy to use and low maintenance as all you do is stick them on, and they do the rest. The perfect one a day solution to quitting. They come in three strengths 25mg 15mg and 10mg most people start at the strongest for 8 weeks, then cut down to the 15mg for 8 weeks then to the 10mg for 4 weeks. Why rely on will power alone? Support your body against withdrawal symptoms so you can focus on breaking the ritual and improving your health and well being.